OK, that pun didn’t quite work, but we’re not the Daily Mirror, you know. Our cack-handed wordplay heralds some news just in about London’s most famous detective, Sherlock Holmes. Early adventures of the former Baker Street resident are to be re-serialised by Stanford University. 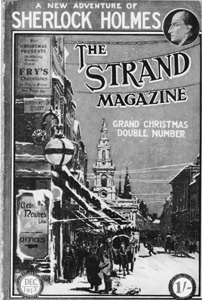 Starting in 2006, weekly e-mails will be sent to subscribers containing the stories ‘just as they were originally printed and illustrated in The Strand Magazine’. To sign up for the free instalments, register here. In other Holmesian news, a couple of new books scrutinize the great detective in, according to The Times ‘pointless if ingenious detail’. On many pages, Arthur Conan Doyle’s text is entirely eclipsed by Klinger’s voluminous notes, which garner the fruits of Sherlockian industry. That may sound off-putting, and it is true that calculations of the number of times Holmes is on record as laughing (answer, 292), or speculations about whether he was really a woman, or whether Watson had two wives, can pall. But there are compensations. Meanwhile, Nick Rennison, author of the trainspottery 'London Blue Plaque Guide' has just released a biography of the opium-smoking sleuth. The work collects together mountains of accumulated evidence to suggest that Holmes and Watson were real, historical characters. As a child, Holmes was almost autistic, Rennison speculates, so was not sent to Harrow with his brother Mycroft but privately educated. At Cambridge, he shunned his fellow students, as he tells Watson, and dropped out to join Henry Irving’s acting company at the Lyceum. Sounds insane, but we’ve already pencilled it onto the Londonist Christmas gift list.